The stoat is middle in size of the three species: forefeet approximately 20 mm long by 22 mm wide; hind feet approximately 42 mm long by 25 mm wide. Weasels are the smallest: forefeet approximately 13 mm long by 10 mm wide; hind feet approximately 15 mm long by 13 mm wide. Ferrets are the largest: forefeet approximately 35 mm long by 35 mm wide; hind feet 50 mm long by 35 mm wide. 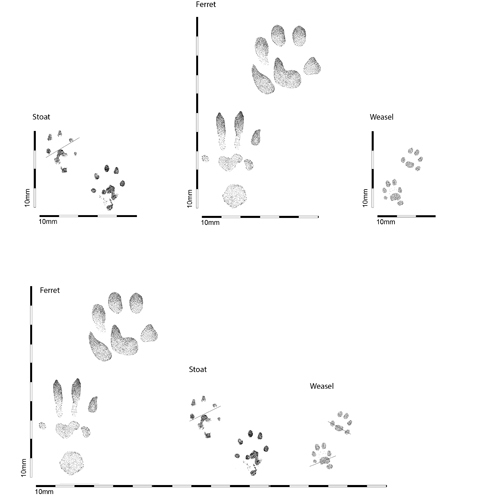 Note: because all three species walk on their hind tip toes, the hind feet prints are smaller than the actual size.Occasionally there will be an overlap in the size of footprints between different mustelid species i.e. between very young ferrets and large male stoats, and between small female stoats and weasels.